An officer of two-star rank is a senior commander in many of the armed services holding a rank described by the NATO code of OF-7. The term is also used by some armed forces which are not NATO members. Typically, two-star officers hold the rank of rear admiral, counter admiral, major general, or in the case of those air forces with a separate rank structure, air vice-marshal. 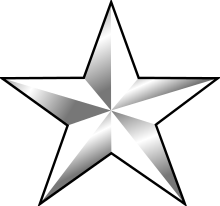 The two-star rank in Brazil is the first rank in a general career. The officers in this position are normally brigade commanders. Rather than stars, the Canadian Forces insignia use maple leaves. The maple leaves appear with St. Edward's crown and crossed sabre and baton. Before unification, air vice marshal was the two-star rank for the RCAF. Not to be confused with Generalmajor and Vizeadmiral (one-star ranks; OF-6) of the Wehrmacht until 1945 or the National People´s Army (East Germany) until 1990. An Indian Navy Rear Admiral in a car having two-stars. In the Russian and Soviet armies, the rank wearing two stars is lieutenant-general (Russian: Генерал-лейтенант), however the general in charge of a unit equivalent to the one led by a NATO two-star general (a division) is major-general (генерал-майор). This also applies to the air force, MVD, police, FSB and some others, and is caused by a Russian brigades being commanded by colonel, with the smallest unit commanded by a general being a division. In the navy, the equivalent rank is kontr-admiral (Russian: контр-адмирал).